What really counts for achieving the success, the goals, aspirations and dreams that God has put in your heart for your life? Does that mean, “with all your heart?” Do you think that suggests we should do what we choose to do with ‘gusto’ and vitality as well as with vibrancy and energy? Where are you going to get that? It’s vital for us to identify what the deep-down desire in our heart from God really is. When you know there is something bubbling up from your inner most being, that God is giving you a passion to do, and if you pursue that, it will make all the difference in the world. And that’s the key to provide the energy that will make a difference in your daily work. Whatever it is that you do, find something in it that will give you delight in doing it. Even if you’re in a difficult situation, just think of others in the world you may have heard about who face difficulty. Is it possible for them to have Godly passion and delight in the midst of their trying circumstances? If it weren’t we would understandably tend to be hopeless. But I’m reminded of the story of Viktor Frankl. He reported after he was released from a Nazi concentration camp for Jewish people during World War II that he discovered there was one thing his captors could not take away from him – the freedom to exercise his own attitude. Here are some of his quotes. There is nothing in the world, I venture to say, that would so effectively help one to survive even the worst conditions as the knowledge that there is a meaning in one’s life. The Bible gives us a lot of guidance in how to have a right attitude, doesn’t it? It will reflect a right standing with our Lord and Savior. So if we’re going to be truly effective in anything we pursue, the passionate approach is going to make the difference between truly outstanding and mediocre. The choice is ours. Remember the passage in Psalm 37 where it says that “He will give you the desires of your heart?” When will God do that? It’s when you decide to absolutely delight in Him. And that means abandoning all your excuses and all your fears, making the determined commitment that you’re no longer going to settle for a half-hearted attitude toward whatever you do in your life. Those deep-down positive and good desires in your heart are from God, your Heavenly Father. Think about it. The word ‘desire’ is made of two parts; “sire” meaning to father and “de” meaning ‘derived from.’ When it says ‘He gives you the desires of your heart’ think about how your heavenly Father is actually placing those righteous desires in your heart when you are one who ‘delights’ in Him. If it’s worth doing at all, you may as well enjoy the ride and do it with all your might. He made you with the capacity to enjoy all the gifts and opportunities in life. You may as well discover the passion in those opportunities that gives you the energy to accomplish the results that will really make the difference in your journey toward your goals. When we decide to make God’s purposes our purposes, and put His priorities ahead of our priorities then all these other things will be added to our life. Jesus said that when He goes away that He would send another Comforter to His followers. He will guide you into all the truth. The Holy Spirit – the Comforter – is here with you right now. He’s operating in your life right now. He wants the inroad to your heart so He can make the things that are most important to your life able to give you passion and purpose. When you do that it starts to make a difference in your choices. You’ll make choices every day. What are you going to do with your time? What are your priorities in life? Who are you going to spend your time with? How are you going to use your time wisely or unwisely? I discovered that God was doing exactly as His Word describes, “at work in you both to will and to do of His good pleasure.” (Philippians 2:13). He’s doing the same thing in you right now. 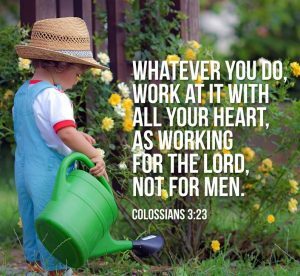 He wants to perfect in you the good works that He has prepared for you to work out as you serve Him (Ephesians 2:10).